Places to see in Chilka: You will undoubtedly treasure your visit to Chilka, admired with such exotic sightseeing locations. 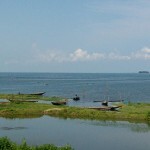 Chilka is dotted with a number of islands. You can hire OTDC boats at Barkul and Rambha. Pay a visit to Nalbana, a big island located at the center of the Chilka Lake. The avid bird watchers will really have a visual treat in visiting the island, which is the haven of migratory birds during the winter. Make a trip to the Bird Island, which is also a natural habitat of different species of birds. Some other major islands include Phulbari, Parikud, Nuapara and Tampara. Another attraction is the Kalijai temple located in an island withing Chilka, housing the shrine of Goddess Kalijai. Tourists’ inflow increases at this location at the time of Makar Mela. You will be amazed to see flocks of peacocks roaming all around the island. The Dolphin point in the Chilka Lake is where you can savor a glance of Irrawady dolphins and bottle-nosed dolphins. The Breakfast Island is just a 20 minutes boat ride from Rambha. From here you can also visit Honeymoon Island and Beacon Island. Also pay a visit to the village of Mangalajodi, which was earlier inhabited by the poachers. Nearby attractions around Chilka: Trips to the nearby spots of tourist interest around Chilka will make your experience at the location more exciting. One of the most sought after destinations of the tourists is Nirmaljhara, which features a perennial stream flowing into a number of ponds. The area also houses some beautiful temples. Tourists with an adventurous mind can take a bath in any one of the ponds in the location. You can also make a trip to Banapur, renowned for the Bhagwati Temples and markets. A day trip to the Salia Dam built on River Salia is also quite rewarding. Tours are also organized to Narayani, famous for housing a temple amidst a scenic backdrop. You can also make tours to Puri and Gopalpur-on-sea from Chilka. Things to do in Chilika: You can hire a boat in the Chilika lake, to cruise around this azure brackish water of Orissa. Visit the different islands dotting the lake while cruising. Water scooters and Pedal Boats are also available at Barkul. How to reach Chilka: The nearest railhead of Chilka is Balugaon, on Howrah-Chennai track. You can avail the buses from Balugaon to reach the lake. Some of the trains that halt at Balugaon are East Coast Express and Howrah-Chennai Mail. Chilka is also accessible by roadway. You will find a number of state operated buses (OSRTC) running from Bhubaneswar to Balugaon. Taxis and auto-rickshaw are available at Balugaon, transferring passengers to Rambha or Barkul. However, you can also avail flight to reach the Bhubaneswar airport, located 120 km. away from Chilka. Taxis and buses are available at the airport carrying tourist to Chilka lake. Best time to visit Chilka: The months of winter is the ideal time of visiting Chilka, as the migratory birds from far off regions arrive this destination during winter. Lodging and dining facilities in Chilka: Not much lodging facilities are available in Chilka. However, you can always locate some eateries nearby, catering some fresh catches like prawns, crabs, pomfret and others. Photographs by Debkinkar Baidya, Dipanjan Mitra.